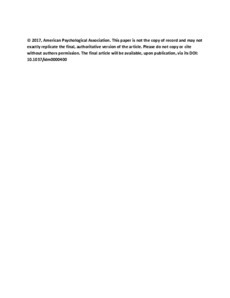 � 2017 American Psychological Association This article may not exactly replicate the final version published in the APA journal. It is not the copy of record. It has not yet been published. Event-based prospective memory (PM) tasks require participants to substitute an atypical PM response for an ongoing task response when presented with PM targets. Responses to ongoing tasks are often slower with the addition of PM demands ("PM costs"). 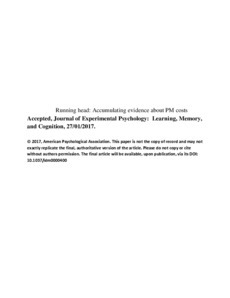 Prominent PM theories attribute costs to capacity-sharing between the ongoing and PM tasks, which reduces the rate of processing of the ongoing task. We modelled PM costs using the Linear Ballistic Accumulator and the Diffusion Decision Model in a lexical decision task with non-focal PM targets defined by semantic categories. Previous decision modelling, which attributed costs to changes in caution rather than rate of processing (Heathcote et al., 2015; Horn & Bayen, 2015), could be criticised on the grounds that the PM tasks included did not sufficiently promote capacity-sharing. Our semantic PM task was potentially more dependent on lexical decision resources than previous tasks (Marsh, Hicks, & Cook, 2005), yet costs were again driven by changes in threshold and not by changes in processing speed (drift rate). Costs resulting from a single target focal PM task were also driven by threshold changes. The increased thresholds underlying non-focal and focal costs were larger for word trials than non-word trials. As PM targets were always words, this suggests that threshold increases are used to extend the time available for retrieval on PM trials. Under non-focal conditions, but not focal conditions, the non-word threshold also increased. Thus, it seems that only non-focal instructions cause a global threshold increase due to greater perceived task complexity.